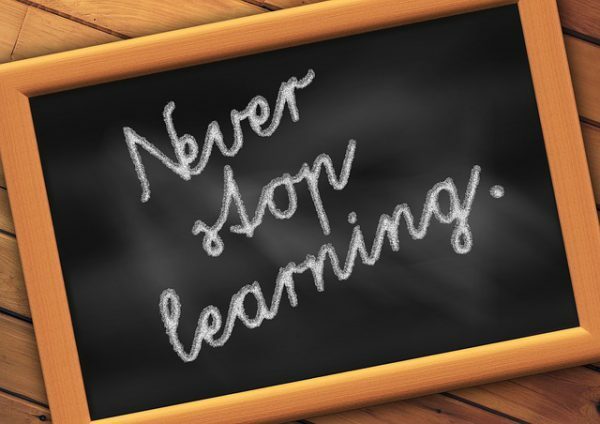 Home » Blog » Awareness » How to never stop learning? The ability for life-long learning is related to the self-awareness part of HumanBusiness. Learning is seen as a tool to become aware for new possibilities in our environment. Possibilities can appear in the form of tools, maps or inspirational people (role models, mentors, friends or family members. These possibilities can have an influence on our actions, thinking and beliefs. Learning provides us with the opportunity of acquiring new knowledge, which might modify or reinforce our existing knowledge. This change of our knowledge happens naturally and therefore we should not be afraid of change. It is essential for our personal development and making progress. To elaborate on our natural longing for knowledge, see for example the TED talk of Science writer Annie Murphy Paul in which she talks about how early we start to learn. She presents research that proves learning already starts before we are born. Learning is natural for us even before we are born. So why should we ever stop it? The education scientist Sugata Mitra has done some real-life experiments with children where he provided them with self-supervised access to the Internet. His research can be interpreted in the way that if we are eager to find a solution we will do so, no matter what the circumstances are. In order to reach even higher results he states that encouragement and collaboration are key. But see for yourself in his TED talk about the child driven education. Is knowing obsolete in the digital age? Mitra has also provided the idea of knowing being obsolete in our times, where you can look up the desired information with just a click. Therefore, he introduced the school in the clouds, which is focusing on the individual interests of an individual. But that is another story. I believe that a great point has been made by Mitra. His research shows that when we encounter an obstacle that we want to solve, our natural curiosity will lead us to the solution. However, our motivation has to come from within us to get our heads into a certain topic. If someone tells us to learn or do something, but we do not understand why this might be important, thus we do not see the value of doing it, we are not motivated to put any effort into it. Nevertheless, I believe that if we are able to formulate a question which is troubling us we are also able to find a solution to it. The Eureka-effect or Aha-moment goes back to the ancient Greek polymath Archimedes. The tyrant Hiero asked Archimedes to measure the volume of his crown. He suspected that the goldsmith had betrayed him by replacing some gold with silver. While taking a public bath Archimedes realized that he could measure the volume of the crown by putting it into water. Since gold is heavier than silver, a crown of pure cold would displace less water than a crown mixed with silver, because it would have less volume at the same weight. In his excitement Archimedes run home naked shouting “Eureka!” Meaning he found the solution. Although it is questioned if the story happened in that exact way, a lot of Aha-moments seem to appear under the shower, since our unconscious mind is still focusing on the obstacle we want to solve, but we are relaxing our conscious mind. So how will we know when to stop looking into a certain topic? 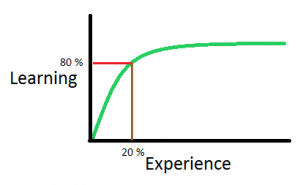 Fortunately there is the Pareto principle. This 80-20 rule is named after the Italian economist Vilfredo Pareto who discovered that 80 % of the land in Italy was owned by 20 % of the population. 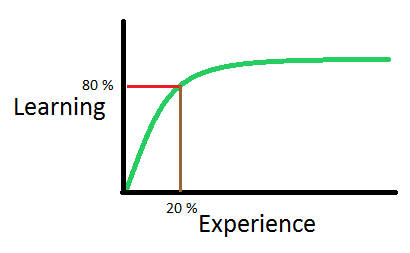 What this means for learning is that 80 % of our learnings (red in the above image) come from 20 % of our experience (brown). That means we do not have to study all the available material to be able to understand a new topic. One indication that we are reaching a learning plateau is when we stumble upon repetitive material. In case of a new action, thought pattern or belief it could mean that our acting and thinking will take place automatically. What can we do to learn? The question arises of how do we get exposed to other tools, maps or inspirations in the form of people? What can we do to learn from these possibilities? In general, when we have identified the obstacle we are currently facing and are willing to solve it, thus are motivated to look for solutions, it comes down to observing our environment and recognizing patterns that are helpful for our situation. Learning from other people or their achievements is probably the most common and maybe also the easiest method to get inspirations. We can simply observe what other people do and how they are able to achieve outstanding results, thereby recognizing their actions and the effect they have. This could happen through seeing the people which inspire us performing live. Normally these persons are our role models, but we should not forget that we could also learn from the persons which are closest to us. We are able to observe how our closest friends or family members are trying to handle their obstacles every day. We just need to pay attention very closely to see the small everyday achievements, since we are so used to looking for the big impacts. As we tend to focus on the success stories I would like to highlight that we can learn much more from the failures of others. Just think about how many people reach the medial attention to be recognized as a success story. For them everything worked out eventually and that is why they seem so extraordinary to us. However, those people failed and struggled most probably more than we would assume. But what made them successful in the end is that they learned from their setbacks and never made a mistake twice. Getting exposed to the thinking and beliefs of other people requires more than just observing. In order to understand their motivation for certain actions or how they see the world it is necessary to engage with them. We could passively hear about their stories by watching documentaries, reading autobiographies about and from the people which inspire us, or listen to interviews. We could also actively talk to them and listen to their stories. We could also communicate our own obstacle and seek for help. This could take place on a regular basis with a close friend for example. Tools and maps can provide inspiration for our own actions. We can learn from these possibilities by studying their usefulness for our current problem. Compared to just observing or asking other people for help this requires more effort from us, because we need to interpret if a tool or map is useful and how we can make use of it. But as we are motivated to tackle the obstacle we are currently facing, we will be able to understand how the tool or map is working. Eventually we will also figure out how to use it for us and what we need to do specifically. Our thinking or thought patterns can be trained like a muscle. Obviously this requires some time and continuous repetition. Does that sound boring and reminds us of school? Coming back to the argument of Mitra that knowing is obsolete; I believe that school has taught us more than just repeating and memorizing useless knowledge. Through education the way of structural thinking or approaching a problem in an analytically or creatively way can be shaped. Therefore, the best way to train how we think, and at the same time get exposed to new tools, maps and other people, is to receive education. Either form others or from ourselves. The beliefs we have are based on the experience we gain by solving diverse kind of problems. As mentioned earlier, the most successful people are those that failed the most. They see every obstacle they face as a project they want to solve. Once they solve a project, they continue their path. They will probably encounter another obstacle, but they see it as just another challenge. In my opinion the most effective way to get exposed to other beliefs is to travel the world. See other ways of doing things and get to know other perspectives. Dare more. Take the risk and do not live in fear. Our beliefs or perceptions on how we see the world has a huge impact on how we think and eventually act. Therefore, I would recommend you to take some time to reflect and try to see the bigger picture. This part is equally important as learning to become aware of ourselves. Share your best advices in the comments. ← How to become self-aware?